Marian memory of devotional origin. The title of Carmel remembers the spiritual heritage of the prophet Elijah , as a contemplative and a staunch defender of the one God of Israel . On Mount Carmel in the twelfth century some hermits gathered in order to devote themself day and night to the praise of God under the patronage of the Blessed Virgin Mary . In 1245 Pope Innocent IV approved the Rule of the Carmelites who , in those years , had as Superior General S. Simone Stok . July 16, 1251, Mary allegedly appeared to this holy man showing him the dress that was supposed to be the hallmark of the Order . 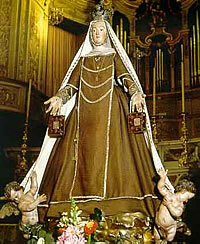 Innocent IV blessed this dress and granted many privileges , not only for the members of this Order, but also for all those who entered the Confraternity of Our Lady of Mount Carmel . Bringing the scapular , which is the reduction of the Carmelite Fathers , they participate in all their merits and can hope , by the Virgin, a speedy deliverance from Purgatory , if they were faithful in abstinence , chastity according to their state and recite the prayers prescribed by Pope John XXII in the Bull , called Sabatina , published March 3, 1322 . So the feast of Our Lady of Carmel , specifically to the churches of this Order, was extended to all Christendom by Benedict XIII , in 1726.